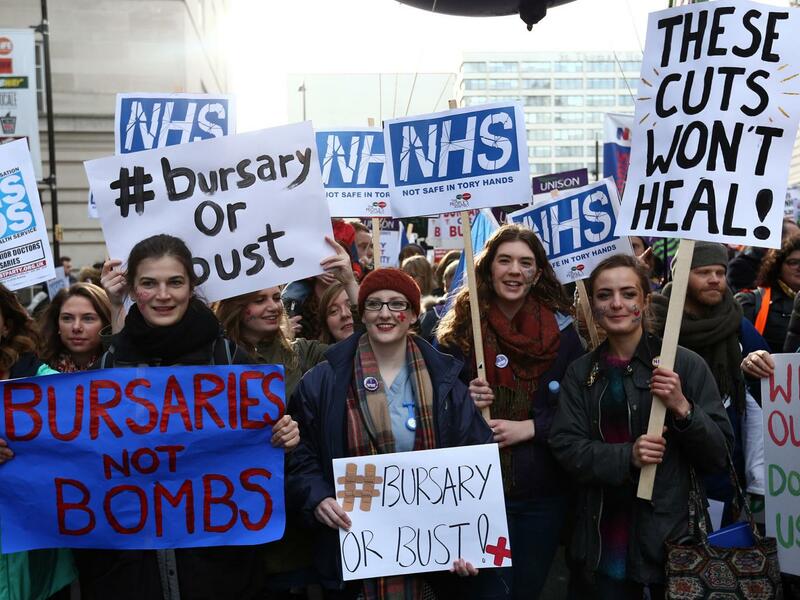 Nurses protested after bursaries were axed – then applications to join the profession slumped [Image: Getty]. This wasn’t a new announcement, of course. The Tories don’t have anything new to say. And Jeremy Hunt’s offer of money (after saying continually that there isn’t enough) isn’t likely to cut any ice. Applications to become nurses have fallen because the Tories have made it unattractive as a career. He simply isn’t offering enough. That failure will bleed on through into the private health sector that he loves so much, of course – with fewer nurses joining the NHS, there will be fewer nurses to poach, and employ privately. Another Tory failure. Isn’t he? Jeremy Hunt will try to reverse a damaging crash in the number of applications for nurse training, with a promise of cash for fast-track courses. The Health Secretary will announce an “historic 25 per cent increase in nurse training”, to allow an extra 5,000 nurses to start their degrees next year. He will also pledge funding for a further 5,500 “nursing associates” each year – who will “earn and learn”, rather than study full-time through a traditional university degree. The announcement comes hard-on-the heels of a 23 per cent collapse in the number of applications to nursing and midwifery courses at British universities, this autumn. The Tories are desperately trying to follow the agenda which is being set by the Labour Party, but they don’t really want to spend any money on anyone but themselves and their small clique of millionaire donors, so it’s all rather pathetic. So Hunt’s solution is to provide even more nursing places even though the current places cannot be filled because of the bursaries he scrapped. He also wants to re-introduce cheaper Pupil Nurses that Thatcher scrapped in the 80’s. It seems to me that he’s attempting to get nursing “on the cheap” where cheaper “Associates” take the place of the fully qualified just like teaching assistants are taking the place of qualified teachers within education. It’s easy to say they will have 5,000 more university places but the logistics of that i.e room to teach and additional lecturers is not so easy. The idea of Nursing associates is a return to the traditional training earn and learn initial University training is a very new concept in Nursing, and should not be referred to as traditional in any way shape or form. The whole university idea which lead to a reduction in numbers at the outset, and now seems to be responsible for a further fall, was simply to be able to train nurses to work anywhere in the eu, not for the needs of the UK. Until Jeremy Rhyming Slang learns that, nursing will continue to struggle. the tories are the fault, hunt the -unt is the failure, they should do the country a favour and all move to Yemen, where hopefully, they will be targetted by the same weapons they sold to the murdering arabs. The tories are also ‘throwing pennies’ at the teaching profession, having made it such an unattractive career that they’re struggling to recruit. This year my strapped-for-cash school (is there any other kind?) has taken on a TeachFirst unqualified teacher. TeachFirst is an organisation that places graduates who haven’t got a teaching qualification in schools, where they learn to teach by doing it. In practice this means that my bottom-set students, who are preparing for their English GCSE, have a teacher who knows nothing about the Shakespeare text they’ll be examined on, and little or no awareness of how to use punctuation – but is teaching both. I’m a teaching assistant so I’m witnessing this in the classroom, where I have supported this particular class for the last two years, and I’m disgusted that the confidence and knowledge the students have painfully built up, with my help and that of a committed capable teacher, is being stripped away by this well-meaning incompetent. But hey, it saves the school from having to pay a real teacher for maternity cover, and there’s plenty of evidence that the right wing has no interest in allowing the proles to get a decent education. They might vote Labour if they had the mental capacity to think about it!